Powered by the lifesaving lightbulb, SafeLight, CareValidate provides health, safety, and quality of care telematics to transform workers’ compensation, senior living, long-term care, life and health insurance providers with plug-and-play insurtech solutions. As we complete our eighth week of the accelerator program, we had a chance to sit down with Jay Pugliese to discuss their product, SafeLight. 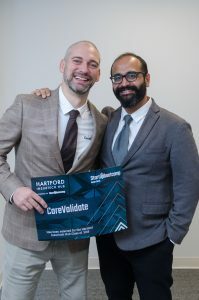 As Vice President of Business Development and Co-Founder, Jay joins us from Alpharetta, GA, after being selected for the second Hartford InsurTech Hub’s cohort. What is the SafeLight blub? How did you come up with the concept of a life-saving light bulb? The Co-Founding Team at CareValidate set out on a mission to stop senior assault, abuse, and neglect. We have all had poor experiences in Senior Living with loved ones and our goal is to protect our aging population. Through extensive research, we found our competition in the market is silo reactive solutions or they had issues with the installation of sensor technology and the adoption of wearable technology from seniors. We could see that there was a need to move away from the siloed approach but also provide caregivers with a simple to use all-encompassing tool to assist in providing quality care. CareValidate’s flagship product, SafeLight, was co-created with senior care insurers. It is a health monitoring and emergency response light bulb that uses highly sensitive movement, sound, and temperature sensors to deliver continuous health and care quality monitoring at the fraction of the cost of intermittent hospital-based monitoring. Sensor data is converted into personalized and actionable early warning alerts with machine learning for caregivers, facility operators and family members to reduce claim frequency and severity. SafeLights also generate proprietary dynamic risk modeling data for senior care insurers for use by marketing, risk management, and underwriting. We do this all by simply screwing in a light bulb. How does CareValidate improve the health and well being of their customers? Before SafeLight, continuous unobtrusive monitoring of a person’s health, safety, and care in senior care or homecare was just a theory. SafeLight’s approach has managed to sidestep adoption issues, there is no need for someone to remember to put a device on, no charging, and no action needed by a resident/caregiver to trigger alarms. Instead, we are able to generate actionable data on caregiver activities, resident health vitals, and automated reactive & proactive alerts through sensors located in the light bulb. By reducing the errors created by adoption issues we are able to give all stakeholder payers, operators and family members peace of mind. The other solutions in this space, only track resident behavior and thus add no value in reducing operator liability due to caregiver activities. Our research shows that the hardware used by these companies make it difficult to differentiate between the resident and caregivers which creates a substantial barrier for them to improve quality of care and enter the insurtech market. How is CareValidate going to change the insurance industry? Prior to CareValidate launching the SafeLight Device in 2018, there was no unobtrusive and quantifiable way to capture the quality of care delivered in senior living institutions in real time. Based on the core principle, “you can’t improve what you can’t measure” – SafeLight will allow insurers to reduce claim frequency and severity, dynamically price policies and open up new markets as this data has never been available to them. 50% of Senior Living is currently self-insured so this gives them the data to expand the market. Health Insurers can benefit by gaining resident activity level, vitals, sleep quality – which are predictors of future adverse events. What’s your current market for the SafeLight bulb?